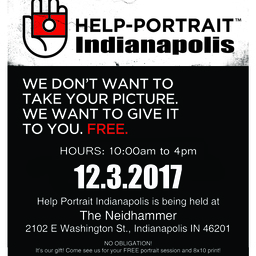 We will be serving with HELP-PORTRAIT® on Dec 3rd to give back to those in need. 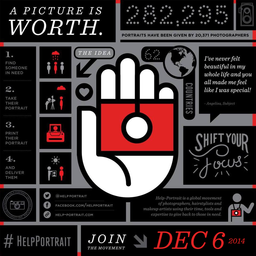 HELP-PORTRAIT® is a Global Movement of photographers, hairstylists, and makeup artists using their time, tools, and expertise to give back to those in need. We're so excited about helping others and we would like to invite you to share in this excitement with us! We started a fundraiser to raise the funding that we need to make Help-Portrait come to life. We have a one time single donations goal of $100 that will go towards the initial cost of the event and to make our guests experience as awesome as possible! It's been our dream to give back and we hope that you will consider being part of this opportunity with us. Every donation is important and will enable us to be present and help others in need. Would you kindly consider making a donation? Also, we would appreciate your willingness to share this with others who may want to participate. Thank you so much for being a part of our lives and helping us accomplish something that's important to all of us! Need to send a check? If you prefer to donate by check please print this form and send it in with your check.